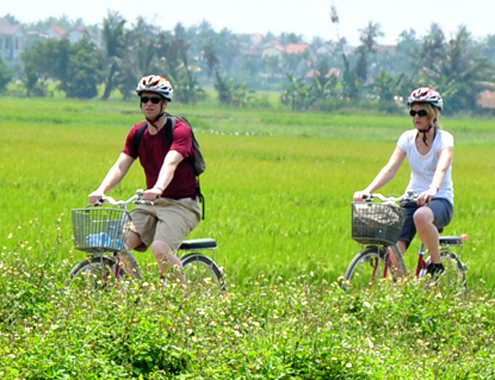 The half-day cycling tour in Da Nang gives you a fantastic experience in a typical Vietnamese countryside with meandering rivers, such large paddy fields that storks fly with their wings out-stretched and some small mountain villages. 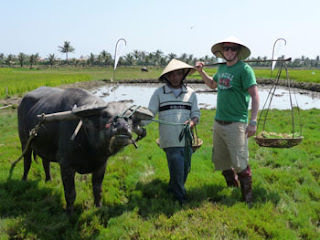 The tour also offers you chance to witness how local farmers grow rice as well as how they raise cultivated shrimp, and to have a perfect traditional lunch at a local house. Especially, the route is wonderful as it takes tourists further out from the center of Da Nang to the peaceful and quiet rural area. Only by enjoying our bicycle tour, will you see it rewarding! Our guide will pick you up at your hotel in Da Nang at around 8:00 (or 13:00) and then head to the bike store. A short briefing and instruction about biking skills and notes will be given to you before we start the cycling tour to Da Nang’s countryside. You will start the half-day tour at a beautiful beach named Thanh Binh (called the Peaceful beach) in Da Nang city. From there, you will bike to the countryside through Da Nang Bay. After that, you will stop at a farm run by a very hospitable family. 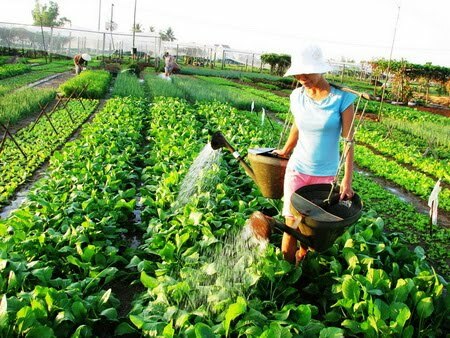 You will get chance to see the farm life, to learn about the processes of growing rice as well as to raise cultivated shrimp and share a meal with the local at 11:30 (or 16:30). After having a traditional cup of coffee or beers at our local friend’s house, our guide will help you to get back to the hotel by private car. Tour ends here.